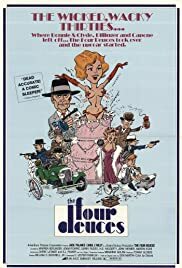 Yet another jokey gangster film which proliferated the screens in the wake of BONNIE AND CLYDE (1967); the ragtime score, then, is clearly inspired by the recent success of THE STING (1973). It's evidently cheaply made and pretty bad overall but, I guess, harmless enough; still, virtually the only thing of interest here is the film's comic-strip look, complete with captioned descriptions during transitions. Jack Palance (another film I watched as a tribute to him - renting this one would certainly not have been a priority otherwise!) mercilessly chews the scenery as one of two warring gang bosses.